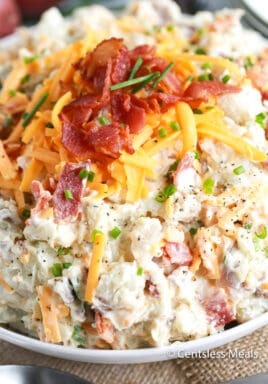 Loaded Baked Potato Salad is always the first thing gone around here! 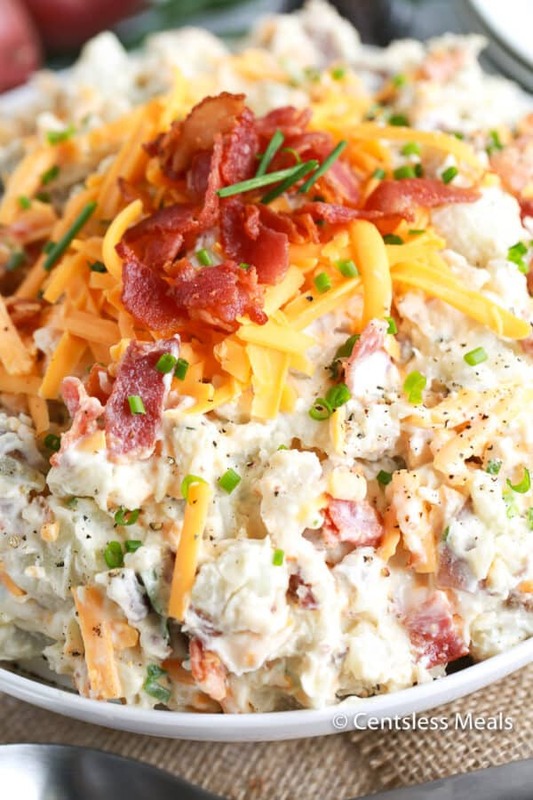 Fresh baked potatoes are cooled and tossed with bacon, cheese, sour cream, and green onion to give you a potato salad like no other. Loaded baked potato salad, twice baked potato salad, baked potato potato salad – whatever you want to call it – will be your new comfort food staple. Rather than boiling potatoes for this recipe, we bake them, which crisps up the skin perfectly and leaves the insides fork tender and uber flavorful! 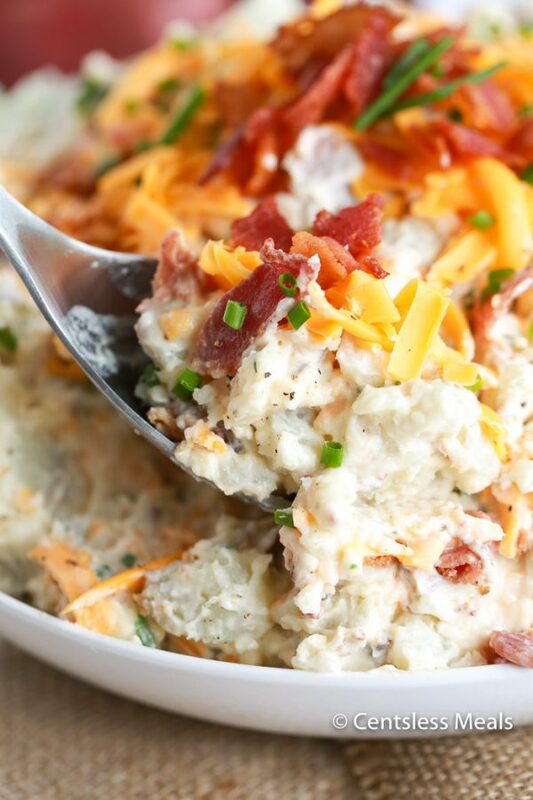 Loaded baked potato salad is so much lighter in flavor than classic potato salad because the dressing is sour cream based rather than just mayonnaise based. If you want to keep it even healthier, opt for low fat sour cream. I love serving this loaded baked potato salad recipe alongside chicken lettuce wraps and strawberry spinach salad for a perfect summer patio dinner! Loaded baked potato salad is a little different than a standard one, but WAY more flavorful. Instead of boiling the potatoes, we cube them and roast them. All sides of the potatoes will crisp up, giving the potato salad an unparalleled texture. Once your potatoes are baked and cooled, assemble your loaded baked potato salad. 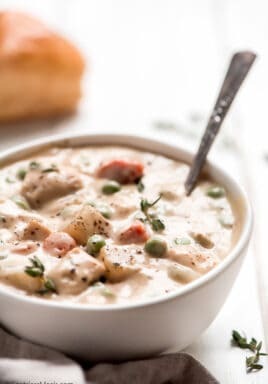 Unlike a standard potato salad recipe, baked potato salad dressing is as simple as tossing bacon, green onions, and sour cream in a bowl. Play around with the flavors, and find out what you like. I like topping my baked potatoes with cream cheese and jalapenos, so I like adding those into this loaded baked potato salad from time to time. 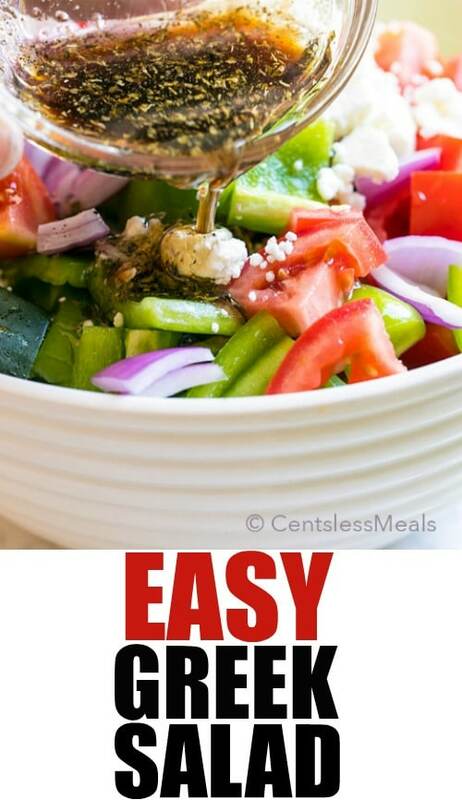 You can create whatever type of baked potato salad you want! Once your potatoes are cooled, toss everything together. Serve your salad at room temperature, or chill it for a couple hours for the perfect cold loaded baked potato salad! Potato salad doesn’t freeze well, I have tried and failed. When frozen, potatoes can develop a grainy texture, due to the starches found in them. It is best to store your potato salad in the fridge until you enjoy it! 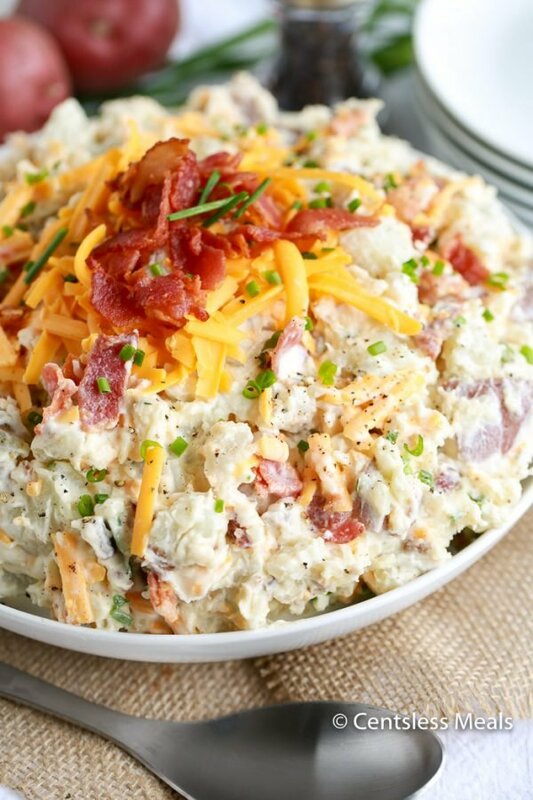 Mayo based potato salad lasts about 5 days in the fridge, and you can expect about the same from this baked potato salad due to the bacon found in it. 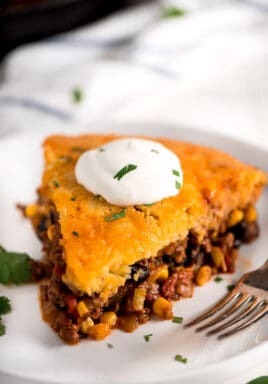 This is the perfect time frame if you plan to make it ahead of time for a potluck or barbecue! Place the potatoes in a greased baking pan; sprinkle with salt and pepper. Bake, uncovered, at 425° for 30-35 minutes or until tender. Cool completely. In a large bowl, give the potatoes a slight mash ensuring you still leave some texture. Combine the potatoes, bacon, cheese, and onion. Combine sour cream, mayonnaise and 1 tablespoon of bacon fat in a bowl. Toss with salad. Season with salt and pepper to taste. I make this also, but try adding sweet potatoes also. GREAT results from the family!They love it! My mom used to make a slightly different version of this. She called it Smashed Potatoes. We had a few more ingredients. Chives and regular cream cheese. She will now be making it again in the near future. How is this served cold. 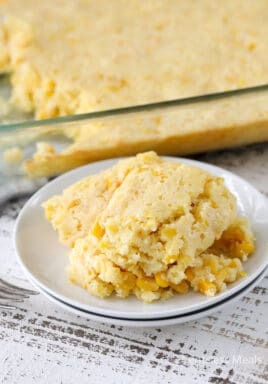 I want to make it for a potluck? i think instead of regular onions this would taste better with chives/table onions! that’s what most baked potatoes are topped with. I will be making this soon. could anyone send me the full ingredients for the baked potato salad? I am not very adventurous when it comes to ad-libbing. Thank you so much. You’ll find the instructions on how to make Loaded Baked Potato Salad on the recipe card in this Loaded Baked Potato Salad recipe post. To find the recipe card, you can scroll down, or click on the Jump to Recipe button near the top of the page. Enjoy Casey! I am new to cooking. How many days after making this will it last? It looks really good.